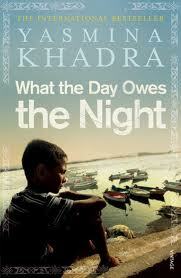 What the Day Owes the Night by Yasmina Khadra is my second book for the Middle East Reading Challenge hosted by Helen's Book Blog. Reading this book reminded me why I chose to focus on North African literature, and honestly why I love books - their ability to transport me to a world I know absolutely nothing about. Set in Algeria, this is a story about love, friendship, family and identity spread over 70 years. Younes, our narrator, is recounting his life and it starts when he is 9 living with his family on their farm. When his father, Issa's, farm is destroyed by fire and he is unable to repay his debt, they leave their farm life and move to the nearby town, Oran. Here Younes and his family live in the slum, Jenane Jato, and his father is forced to do whatever he can to make ends meet. After a series of unfortunate events, Issa (who is a very proud man) gives his son to his affluent brother - a pharmacist living in the European (and richer) part of Oran. The second Younes is adopted by his uncle, his life changes as he becomes known as Jonas. This shapes the rest of his life - as in some ways through the adoption and name change he is saying goodbye to his Arab and Muslim identity. We then learn about Jonas' new life with his uncle in Oran, and their eventual move to the European town, Rio Salado. In Rio Salado, Jonas meets a group of boys that will become his long-time friends. Their friendship, and what they get up to as he grows, is the focus of his life in Rio Salado. Here is where he also meets Emile, a girl who will test this friendship, as she is so beautiful they all can't help but fall in love with her. As they grow up, Algeria is also hit by the revolution and we see how the country changes. Emile and the Algerian revolt introduce us to one aspect of Jonas' character - his indecisiveness. While Younes is a loveable character, his indecisiveness is grinding, and at times frustrating. Younes is conflicted, and at the centre of his conflict throughout his life is his identity. Is he Younes, the Arab he was before he was adopted by his uncle, or Jonas, the European who he becomes once he is adopted? He is an Arab living in a European world, and while Arabs are seen as "lazy and shiftless" by Europeans, Younes is exempt from this description. He is a hard-working, intelligent man from a good background. Yet time and time again he is reminded that he doesn't fit neatly into either box. On one hand Europeans remind him that although he is different from other Arabs, he is still an Arab - like the time when he was young, and a girl who was infatuated with him found out his name was Younes and not Jonas. He goes. ""Everyone calls me Jonas ... What difference does it make?" To which she replies, "It makes all the difference! ... It changes everything". "You surely don't think I could marry an Arab! I would rather die!" While on the other hand, Arabs like Jelloul (one of his friends help) reminds him "You wouldn't understand ... You're one of us, but you live like one of them'. No wonder he was conflicted! What the Day Owes the Night was on quite a couple of best books for 2011/books you must read in 2011 lists, and I can see why. I really enjoyed it and I found it so easy to read. Most of all, I loved the writing. I loved the way every neighbourhood was described - the slums in Jenane Jato, the affluent neighbourhood his uncle lived in in Oran, Rio Salado, the way the neighbourhoods changed over the years. I loved learning a bit about Algeria and the Algerian revolution. It was like I was there and I was able to envision everything. I was transported to Algeria through reading this book, and in particular to Jonas' life. Sometimes I wanted to shake him and say "Make a decision - good or bad, it's better than nothing! ", but even with that I still enjoyed reading it. A thoroughly enjoyable and beautifully written book and one I would definitely recommend. You're very welcome and thanks for adding it to the suggested book list - it's definitely a book worth reading. Nice to read your review of this one. I've heard of it but haven't picked it up. I have read another work by the author though, I believe. I REALLY ENJOYED reading this book!! For me the best book I have read so far in 2016! I actually want to read more North Africa books after having read this one. The way the the author paints pictures with words is beautiful. As you have said it takes you to Algeria! A definite must read! This is, without a doubt, one of my all-time favourite novels. i'm algerian and he is one of my favorite authors particulary this book i love it.